This fall protection system is a cutting edge product designed to protect farm workers from a fall while climbing or accessing a bin for repairs or inspections. In today’s world, worker/farmer safety has never been more emphasized and important than it is right now. At Northern Strands we believe serious injuries are preventable and avoidable with proper planning and systems in place. 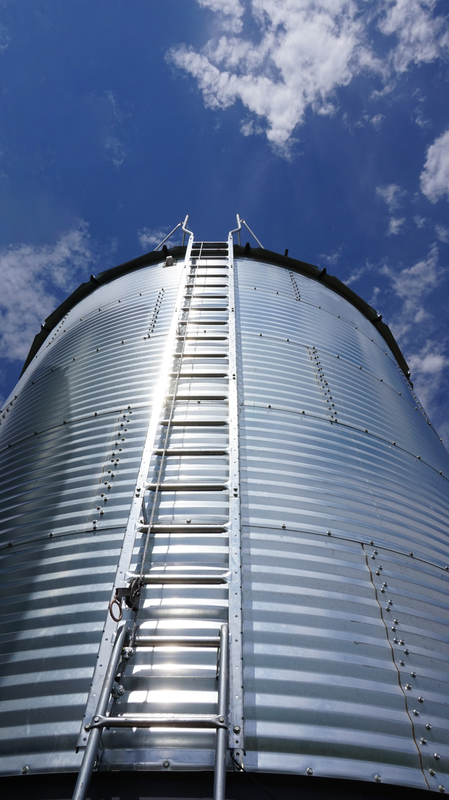 It is with this belief in mind that Northern Strands accepted the challenge of making grain bin inspections and repairs more safe by developing a fall protection system. When properly installed and used, our system will prevent a person from falling off a grain bin and impacting the ground or falling into the bottom of a grain bin and suffocating. Currently this system is compatible with the Westor and Westeel 1805 bins. Northern Strands is working on Fall Protection Systems that will work for other models of grain bins. The launch for this new Grain Bin System is happening at AG in Motion Tuesday July 18, 2017 - Thursday July 20, 2017. AG in Motion is just 15 mins NW of Saskatoon on Hwy 16 at Range Road 3083. Northern Strands will be at Booth Space 420. There will be demos throughout the week. Contact the Northern Strands Fall Protection Division today to find out more about Farm Safety. The Engineered Fall Protection Division offers a variety of fall protection systems, solutions and services. Custom-engineered solutions can be designed to suit specific requirements. Services and equipment include: inspection and replacement services for overhead and vertical lifelines, consulting, supply and installation services for single point anchors, guardrail systems, walkways, platforms and structural assessments.